Today Vancity unveiled its refreshed brand, including two new TV commercials. For the six years I have been at Vancity, I have tried to explain the philosophical construct that is our business model. It is so simple really, we reinvest our members’ money back into community, and increasingly into community projects that create positive impacts directly in our members’ communities. Local and organic foods, affordable housing, social enterprise – areas like these have significant social, financial and environmental impact in our members’ lives and the lives of their neighbours. Rather than make money like any other financial institution can and then grant out money to projects (although we still do a ton of that), we want the way we invest our members’ money and make money for the credit union to have impact. It’s actually quite simple, but I was starting to wonder if our brand could effectively capture this simple truth. Whether our brand could inspire our staff and our members equally. And then a few weeks back, I saw what our agency Wasserman + Partners and my colleague, our VP of Marketing, Rich Seres and Linda Cekal, our Marketing Manager of Brand Experience had been working on. It’s so simple: Make Good Money. We make Good Money for our members by putting money to good. These ads are shot in real places across our Vancity trade region and only feature our real members and staff. I am totally honoured to have my voice included in the voiceover in these ads. I have a deep and powerful connection to Vancity and all it does to improve the lives of people in my city and beyond, and to be the voice of Vancity is humbling and incredibly meaningful to me. Major kudos to my new boss Linda Morris, my amazing colleagues at Vancity and at our agency. I hope you enjoy the ads as much as I do. Really nice William. Both the work and the voice over! William, after reading your post and watching the new commercials last night, I was struck with clarity about why I’ve never felt the same level of affinity for Vancity that you have. Let me explain. I’ve always had tremendous admiration and respect for Vancity, but I’ve never been inclined to join. It wasn’t until I saw the “anthem” ad that I realized why. I live in Chilliwack, not Vancouver. You’ve now clearly defined who your ideal member is. An urban, socially conscious Gen Xer who cares deeply about Vancouver. This is a very strong, clearly articulated message and will definitely set you apart from all of your competition – banks and credit unions included. When Vancity came to my community about 15 years ago, it felt strange. Why is “Vancouver City Savings” in Chilliwack? Chilliwack is a rural farming town with it’s own very distinct community. What could this big city credit union want here, other than our money? Through my years of local community service, as a board member and president of the Chilliwack Chamber of Commerce, I’ve never felt a presence from Vancity. Envision and Prospera have been here for 60 years and are deeply woven into the community and incredibly visible at every community event. At the Symposium, you made a comment something like this, “If Vancity were to cease to exist, there would be a Vancity-sized hole left in Vancouver.” I wonder if the same could be said about Chilliwack or Abbotsford or Langley or Squamish or Victoria? I can see your more urban suburbs like Surrey, Burnaby and Richmond sharing the same concerns and beliefs and feeling the loss if Vancity went away. Take these are observations and not criticisms. Since I am not a member, I cannot speak for members in your outlying regions. I think my thoughts just point to how difficult it is for credit unions to brand themselves and deeply resonate to all people when they expand beyond their original communities. I would imagine the same struggles exist with your internal brand and employee engagement the further out you go. Vancity is living proof that a brand cannot be all things to all people. You and your team have boldly put a stake in the ground and defined who you are and who you want as members. I can’t say that about too many other financial institutions! Kudos again on the new work. It’s really great. I love the good money theme. Very smart. Hi Tim. Thanks for that comment. I would say that Vancity has had more challenges in the Valley than in the core of the city. Having said that, we also don’t have as many branches in the Valley, but the branches we do have there do well. I think as population moves around, from the city to the Valley, and as consciousness changes, I believe our focus on natural and organic food in the farming community will create good opportunities for Vancity. But other FIs have long histories and originated in areas like Chilliwack and so have deeper roots. As I say this, I also agree that we can’t be all things to all people, and our opportunities aren’t equal everywhere. We are conscious of that for sure. I am glad you like the Good Money theme. I have deep respect for you as a Credit Union professional, marketer and savvy individual. Your opinion means a lot to me. I really like these ads. They really give you a close look at what Vancity stands for and what it believes in. I would become a member of Vancity in a minute (wait I already am by having been a signatory on a non-profit account) but due to my current employer (another CU) it limits my participation. What your credit union is doing and what is does is one of the most interesting and wonderful statements that any cooperative can share with its membership. It really is an honour to live and be part of a community where Vancity exists. Keep unveiling that refreshing brand! There is much more to tell. Thanks Gene. I am so pleased with the path we’re on and how we express what we stand for and what we do. That it resonates with you means a lot to me. Fantastic! 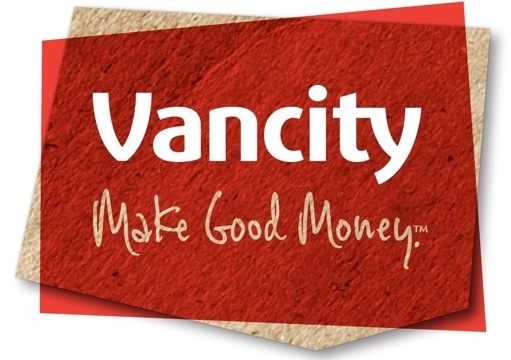 The ‘good money’ theme clearly and succinctly connects Vancity’s business and values, and the ads connect the theme with our communities. It has the feel of the former ‘It’s right here’ brand and pins it to an FI. What could be simpler? Love it! Hi Steve, so good to hear from you! Thanks for the comment, so glad you like the new brand.